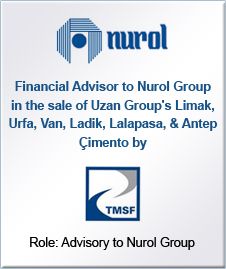 Landmark Transaction: We have completed the largest M&A and privatization transaction in Turkey: Sale of 55% of shares of TurkTelekom to Oger Telecom for USD 6.5 billion through a well-organized tender process in consortium with BNP Paribas and Deniz Yatirim. 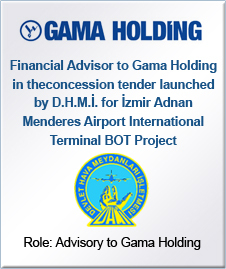 Dalaman Airport BOT Project. 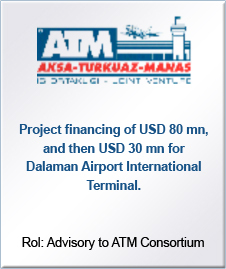 We acted as the sole financial advisor to Aksa – Manas - Turkuaz Consortium on the financing of the Dalaman Airport new international passenger terminal project and raised USD 80 million. 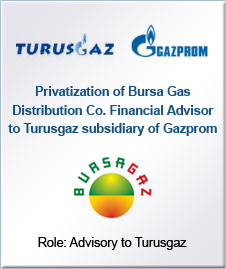 TUPRAS (Turkish Petroleum Refineries Corporation) acquired 51% of shares of DITAS from Privatization Administration. Deniz İşletmeciliği ve Tankerciliği AS, DITAS is a leading Tanker and Marine Operations Corporations of Turkey, active in the transportation by sea of domestic and international crude oil and its products. 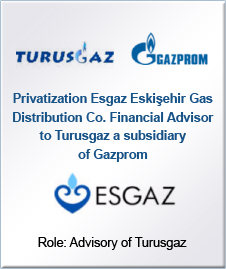 Privatization of Tüpraş Financial Advisor to Gama In their potential investment in Tüpraş.